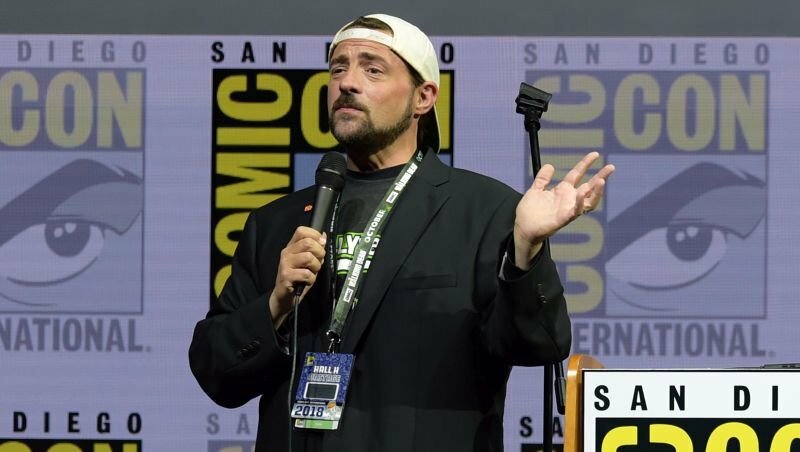 During Kevin Smith’s annual “An Evening With Kevin Smith” panel at San Diego Comic-Con, the director offered an update on his in-development Jay and Silent Bob Reboot movie. Smith confirmed that the upcoming movie is scheduled to begin shooting in November and will see the title duo learning that the film made about them in the first Jay and Silent Bob Strike Back movie (the superhero movie Bluntman and Chronic) is about to be rebooted. The pair then decide to drive across country to stop filming once again, just like they did for the first film. The filmmaker noted that fans should expected similar cameos and asides at the first feature film, even announcing that The Flash stars Grant Gustin, Carlos Valdes, and Tom Cavanagh will all appear in the movie. Smith has previously worked with all three of the actors, having directed three episodes of The CW series. 2001’s Jay and Silent Bob Strike Back was meant to be the final View Askew movie, with God (Alanis Morissette) literally closing the book on it. However, Smith eventually returned with Clerks II in 2006, as well as the little-seen 2013 oddity Jay & Silent Bob’s Super Groovy Cartoon Movie. Other films in the View Askew canon include Clerks, Mallrats, Chasing Amy and Dogma.